CAN A PROMPTER BE USED ? HOW IS THE JIMMY JIB MOUNTED ? CAN YOU SHOOT MORE THAN 1 LOCATION IN A DAY? WHAT FLOOR SPACE / COUNTERWEIGHT DO I NEED? HOW LONG DOES IT TAKE TO BECOME A COMPETENT OPERATOR? 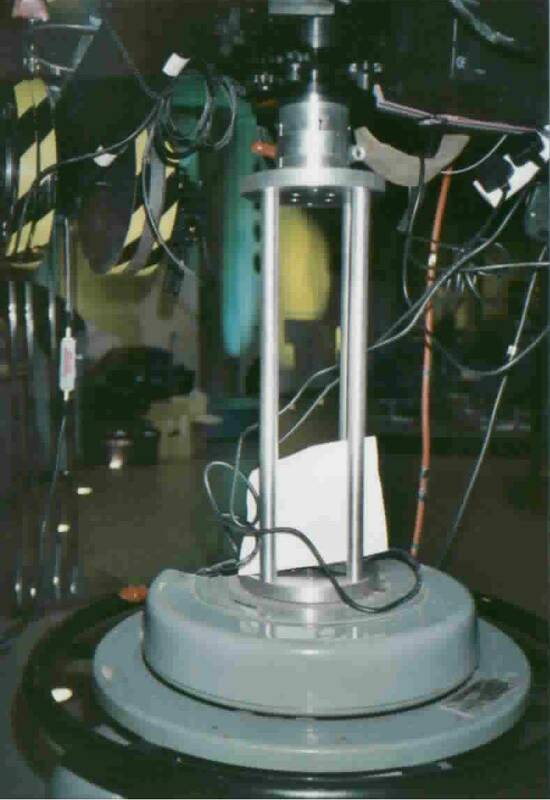 The Jimmy Jib can be set up in various fixed operating lengths depending on room, time scale or required lens height. Jibs do not have to be huge to make a really dynamic shot and the feeling of movement can be significantly altered by various lens angles. 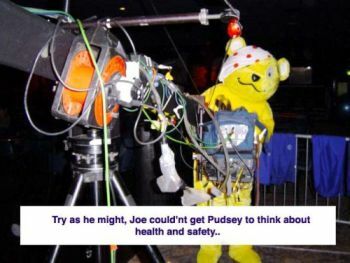 We can advise you if you are not sure. The Extreme, which has a 30ft reach that gives you 33ft lens height. Finally the remote head can be mounted directly onto the tripod. See spec sheet for more details. 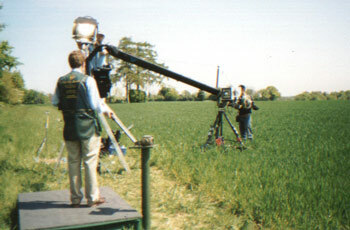 Jimmyjib on a 4 wheel Maxi Dolly. 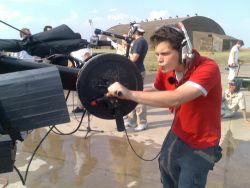 We have also used our Jib with specially adapted camera cars. We arrive in a car or van with the Jib packed in its flight cases. 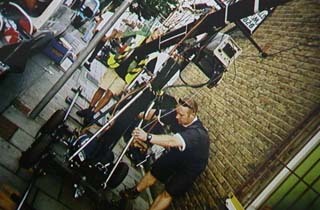 When it is taken to its location and unpacked it takes between twenty minutes and two hours to build depending on the length of the crane and complexity of camera rig. It is quite common for us to set up, take the shots, de-rig and move on. So long as there is enough time allocated we can often do several setups in a day. 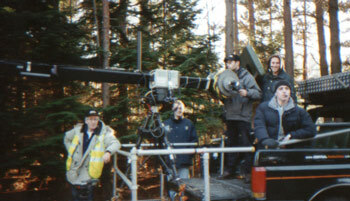 The Jib can also be repositioned fully built with the camera on the end. This is done by two people physically wheeling it from one place to the next. We are obviously limited by the distance and the terrain as it can only be slowly moved along reasonably level ground. If we are using the Jib alongside a camera operator who is shooting while we are repositioning it can become a very effective and efficient day indeed. Remember when shooting Hi Def you may need to order a down converter to see the 625 line PAL image on the PAL monitor. 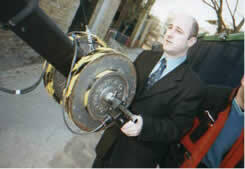 If you are interested in buying a Jimmyjib please email joe*at*joesjibs.co.uk or call us 07973 226532 - 020 8671 5708. 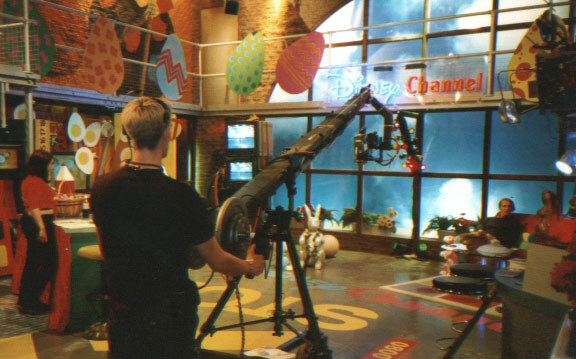 We have successfully installed Jimmyjibs at Channel Five News, ITN and Disney Channel. We have also carried out a training programme for the staff operators at these and other studios. See link. Our Jibs will arrive in an estate car or van. There are a number of flightcases that the crane packs down into making it easily transported. It is possible to take it overseas but if flown it may be wise to source the weights in the destination country to save on shipping costs. The triangular cross section Jimmy Jib is far more rigid and stronger than its tubular predecessor, it is very reliable, and great to operate. The following are measurements, weights and capacities of the Jimmy Jib. STANDARD 6 13 9.5 6 FT X 8 FT 55 lbs. 125 lbs. STD. PLUS 9 15 12 6 FT X 8 FT 50 lbs. 175 lbs. GIANT 12 20 17.5 8 FT X 8 FT 50 lbs. 275 lbs. LONG TAIL GIANT 12 20 17.5 9 FT X 12 FT 55 lbs. 200 lbs. GIANT PLUS 15 22.5 20 9 FT X 12 FT 45 lbs. 225 lbs. SUPER 18 25 22.5 9 FT X 12 FT 45 lbs. 250 lbs. SUPER PLUS 24 30 27 12 FT X 20FT 40 lbs 285 lbs. SHORT TAIL SUPER PLUS 24 30 27 9 FT X 12 FT 45 lbs. 360 lbs. EXTREME 30 35 32 12 FT X 20 FT 45 lbs. 380 lbs.
" Minimum working platform area required - flat surface with toe rail. Most cameremen find the joy stick operation intuitive and can get some very usable shots within an hour or two however to be able to rig and de-rig the kit safely and perform more complex camera moves needs at least a few days of tuition and months or years of practice and experience.